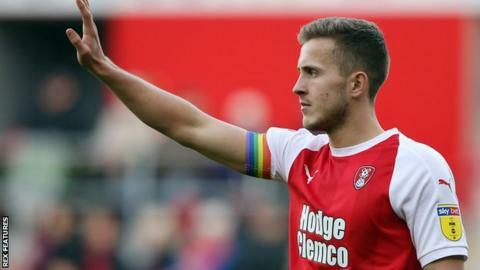 Rotherham United have taken up an option in Will Vaulks' contract to extend his stay at the Championship club by a year. The 25-year-old midfielder, who joined the Millers from Falkirk in 2016, will now remain at the AESSEAL New York Stadium until the summer of 2020. Vaulks has scored six goals in 36 appearances this season. He is reportedly being considered for an international call-up by Wales manager Ryan Giggs. Vaulks, who was born on the Wirral and played for Tranmere and Workington before joining Falkirk in 2013, qualifies for Wales through his mother. "Will is a leader on and off the pitch and is a really big part of what is a fantastic dressing room," Rotherham boss Paul Warne told the club website. "By exercising this option, it gives us a bigger window of opportunity to hopefully try and sit down with Will to discuss the possibility of a longer deal."